In the case of yellow vests on the weekend, among other things, a fine restaurant on the Parisian boulevard was devastated. 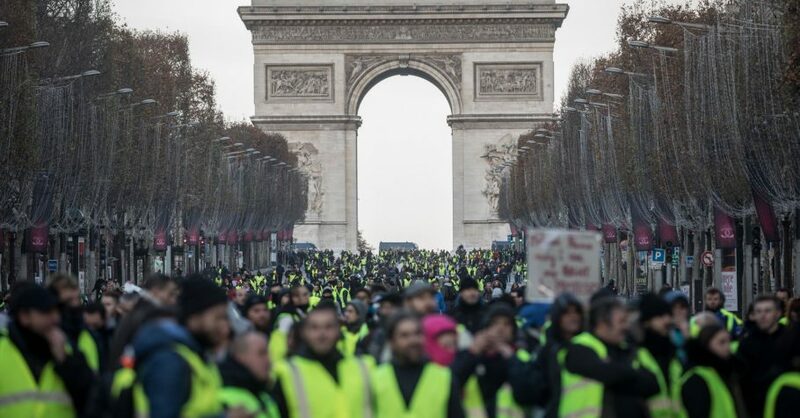 After the recent riots on the fringes of the yellow-voted protests, French President Emmanuel Macron is considering a ban on demonstrations on the Champs Elysees. During the weekend protests, the fabulous boulevard was devastated by the upscale Fouquet’s, two newspaper kiosks burning out. The protesters have been on the streets since 17 November. The highlight of the rallies was attended by more than 300,000 people. The partly violent protests of the yellow vests had ignited government plans for gasoline price increases. They grew into mass protests against Macron, whom his opponents accuse of being a president of the rich. President Macron had canceled a ski trip on Saturday to attend a crisis meeting that evening. He announced “tough decisions” to prevent such riots in the future. All who were on the Champs- Elysées would have made themselves accomplices, Macron said. They have done a lot since November, but that’s obviously not enough. He had already launched the controversial “Anti-Rioters Act” as part of the “Yellow Vest” protests. It facilitates demonstration bans and includes tighter sanctions against hoodlums. Critics see the fundamental rights in danger – even in Macron’s own ranks, many had opposed the law, which approved the National Assembly in February.